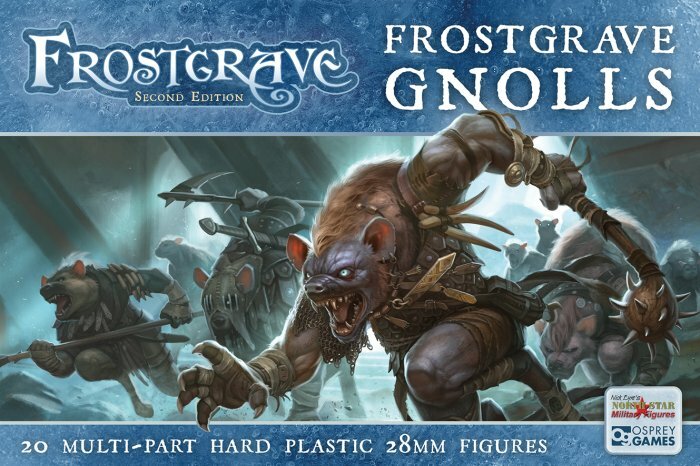 With this new supplement for Frostgrave, players can lead their warbands into the vast network of catacombs, sewers, and dungeons that run underneath the Frozen City. It was in these dark confines that the ancient wizards known as Beastcrafters experimented on living creatures, creating strange hybrids and deadly monsters, many of which still roam the forgotten passageways. So up until now the main rules has been focused above ground in shattered Felstad, Into The Breeding pits allow you to take your game to the dungeons and catacombs underneath, filled with new monsters, including a Minotaur and a Giant worm as well as the Gnolls, which were released in plastic at the same time, or just increase the tempo in the ruins of the once great city. These multi-part figures are great I have to apologise as I have ha them a while and haven’t reviewed them yet so expect to see that soon as well, but they follow the same premise as the Soldiers packs and there is a lot of options in the pack. The Gnolls are just one beast on the random encounter table but to be honest I was looking at making an entire warband of them, not sure how I would work it yet, but we will see soon. Back to the Breeding Pits though, inside the book there are rules for a new forms of Magic, the Beastcrafters, which is unlocked throughout the campaigns, and there associated spells, there are also new items and tables to roll on for treasure and encounters, all of which can be used above ground as well as below. The scariest of which is Nightmare which can reduce the amount of experience earned by a warband by 20xp every game for the rest of the campaign the only way the spell is removed is if the Wizard of the warband is reduced to 0 health. Several of the new items are for use in the Base and others are for use in game, all of which have a nice spread across classes and some could possibly allow a wizard access to traits and bonuses usually associated with other Wizard classes, for example the Bottle of Time allows extra activations in that turn. Typhus – Herald of Fabulous? !